A lamp is often the perfect finishing touch for a room. Dress up your room with a personalized hanging pendant lamp! Hang it over your dining area, your kitchen bar, or your cozy reading nook. Not looking for a hanging lamp? Easily detach the cord and use it as a lamp shade for a floor lamp! At 16" in diameter by 9.25" in height, your pendant lamp will not easily go unnoticed. The lamp shade has a flexible, smooth plastic interior with a choice of polyester or linen exterior. This linen version adds a chic elegance to any room. The shade is finished with white, polyester ribbons lining the top and bottom. The lamp shade comes with a cord that is easily strung up and has a convenient on/ off switch attached. Fits a 60 or 13 watt light bulb (light bulb not included). To clean, simply use a damp cloth. Ladybugs are traditional and loved by all. We have taken the classic ladybug and modernized her to give her an all new vibe. Chevron is the new go to pattern. 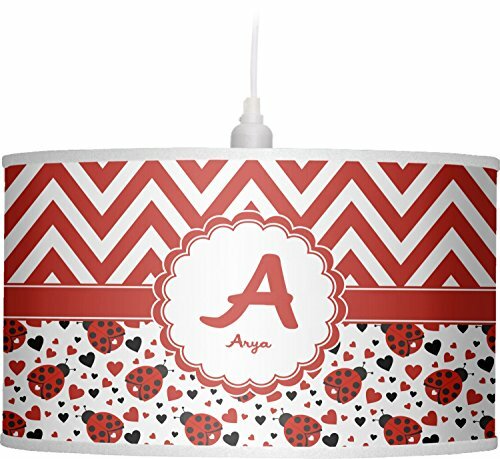 We have created this gorgeous and bold red and white chevron pattern on top but grounded this bold pattern with our sweet little heart ladybugs. Old meets new and it goes so well together.